Kai Yuan Tong Bao [The Inaugural coinage] 1-cash seal script large issue in lovely extra fine. Cast in AD961 under rule of emperor Li Yu of Southern Tang Kingdom [AD 961-978] during 5 Dynasties and 10 Kingdoms period. Early large issue, wide rim. Schjoth quotes: "In the second year of Qiande , Li Yu ascended the throne, and the resources of the country being exhausted, his minister Han Xizai obtained permission to cast coins. 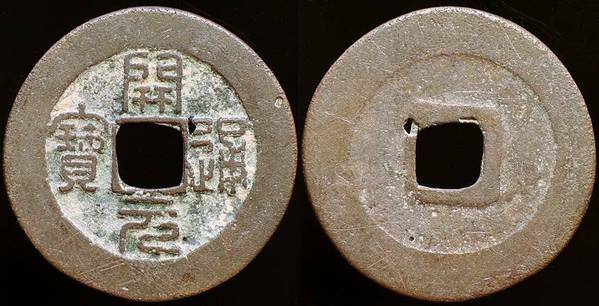 These were on the Kai Yuan model, but in seal writing devised by scholar Xu Xuan. This coin was slightly larger than the old Kai Yuans, and had broader rims, and was found convenient by both the government and the people."